This article provides information about the profile, biography and career records of India's fastest bowler Javagal Srinath. A player who is the third highest wicket taker fast bowler from India and many more achievement. 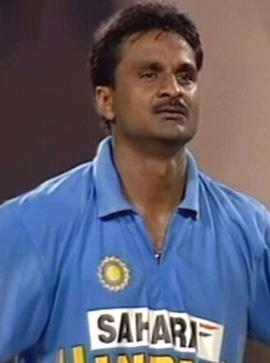 Regarded as the fastest Ever Indian bowler Javagal Srinath was a front line bowler in the Indian Team of 90's. Born in Mysore, Karnatak he was also known as Mysore Express. He is currently the third highest wicket taker Indian fast bowler after Kapil Dev and Jaheer Khan. First Class Cricket - Srinath on his first class debut started with a bang as he make a Hat trick against Hyedrabad playing for Karnataka in 1989-90. He took 25 wickets in that season. This was a great start for a young fast bowler. International Cricket - Soon after his excellent performance in First Class Cricket he was selected for the ODI Team and he made his ODI debut against Pakistan at Sharjah in year 1991 where he pick up the wicket of Wasim Akram sharing the bowl with the other fast bowlers like Kapil Dev and Manoj Prabhakar. In the same year he also got the chance to play in the Test Match against Australiaa, where he impressed all by picking three Australian wickets in the 1st Innings. But he was not a regular bowler of the team until Kapil Dev retired from the International Cricket. With capability of bowling Reverse Swing, incutters and inswingers he become one of the most dangerous fast bowler in 90's and a frontline Indian Bowler. His performance of 6/21 against South Africa at Ahmedabad was amazing and won the match for India. Srinath ten times in Test Cricket got 5 wicket haul in an innings and once got the 10 wicket Haul in a match. His best bowling performance in an innings was 8/86. Srinath was an entertainer when he came to bat. He has the ability to do some lasty hittings which on some occassions has won matches for India. County Cricket - Javagal has also played in the County Cricket for Gloucestershire in year 1995 where he took 87 wickets in the season. He has also played for Leicestershire later.